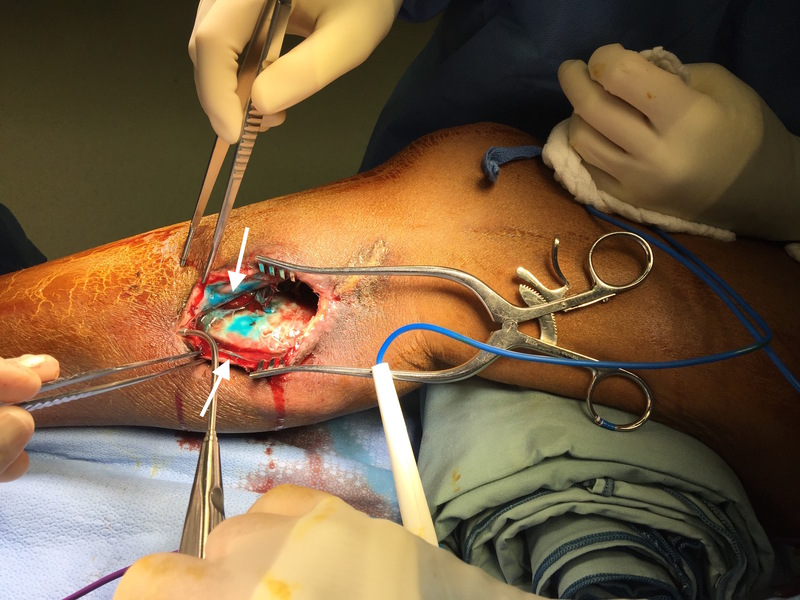 The patient was referred from an outside institution for the development of a large tender mass in her below knee incision after a femoropopliteal bypass done with PTFE for ischemia after a aorto-bifemoral bypass. The patient reported swelling that grew in the months after the operation to the point that she was unable to walk without pain. 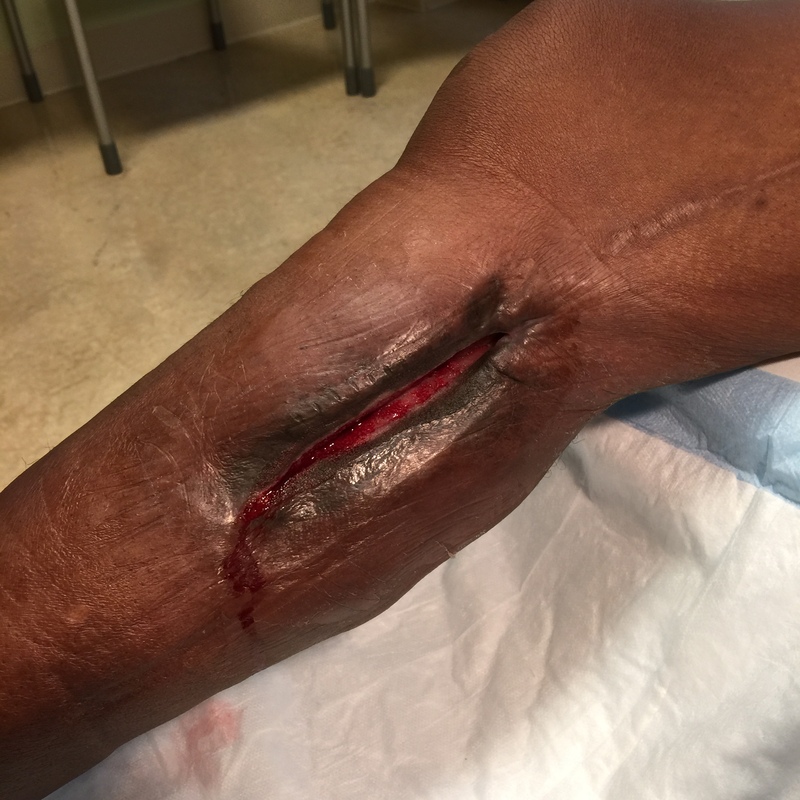 On examination, she had a Nerf football sized swelling in her previous below knee incision without erythema. It was quite tender. 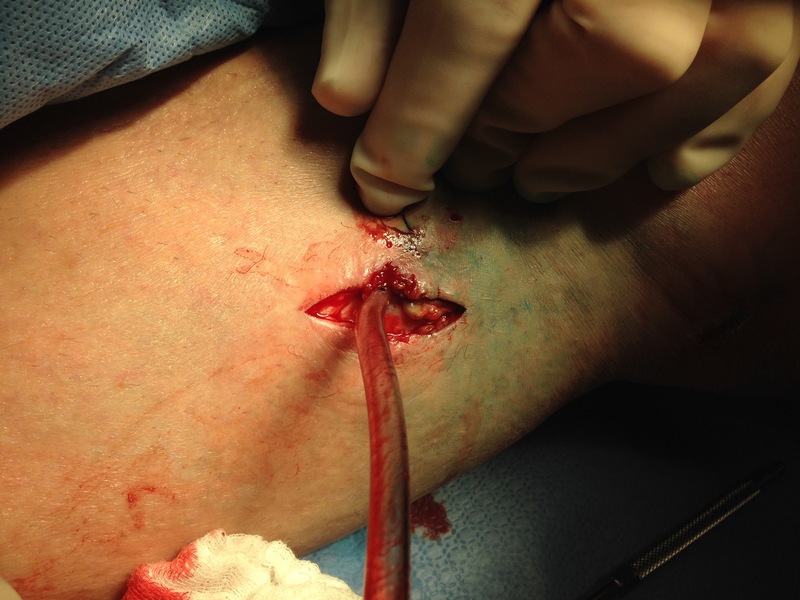 CTA showed a patent aorto-bifemoral bypass and a femoropopliteal bypass to the below knee popliteal artery. 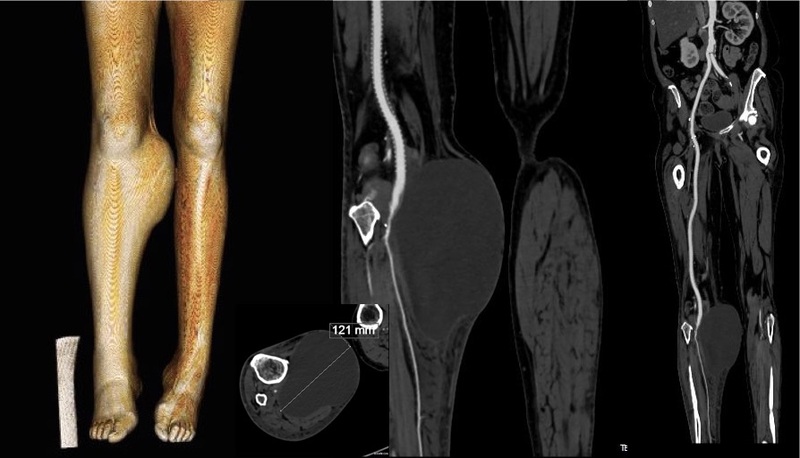 Incidentally noted was the absence or occlusion of the profunda femoral artery. There was bland lymphedema below the knee. Graft infections can present like this, but also drive local and systemic inflammation and in the absence of fevers and white counts, was highly unlikely. Occasionally, indolent infections with S. epidermidis will present with fluid collections but typically this is a late presentation. Ultrafiltration leaks from PTFE are fairly rare in my practice but can occur randomly. Most PTFE grafts nowadays come with an external wrap that acts as a seal against microporosity, but on occasion, I have seen protein rich fluid accumulated around PTFE grafts. This typically is not high pressure and accumulates along significant or whole length of graft. 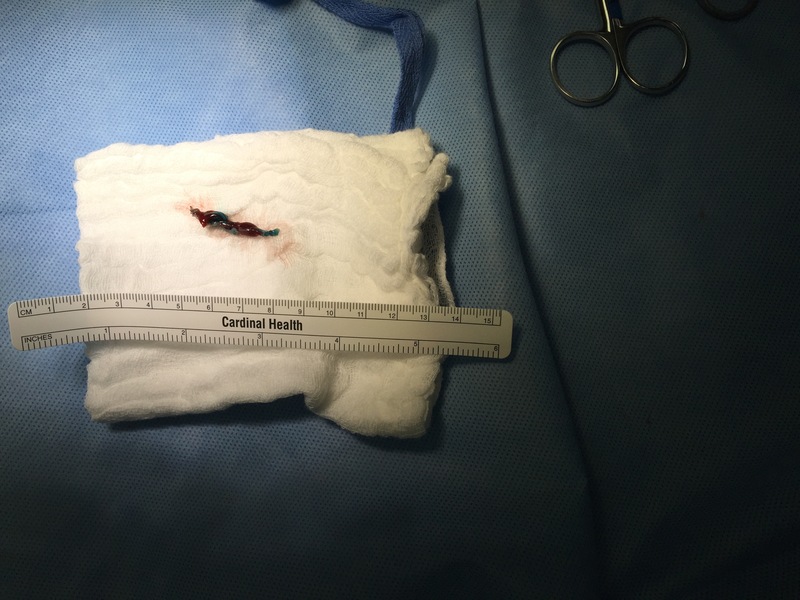 I used to treat that with graft excision and replacement, but I have had success with relining the graft with PTFE based stent grafts and externally draining the seroma. 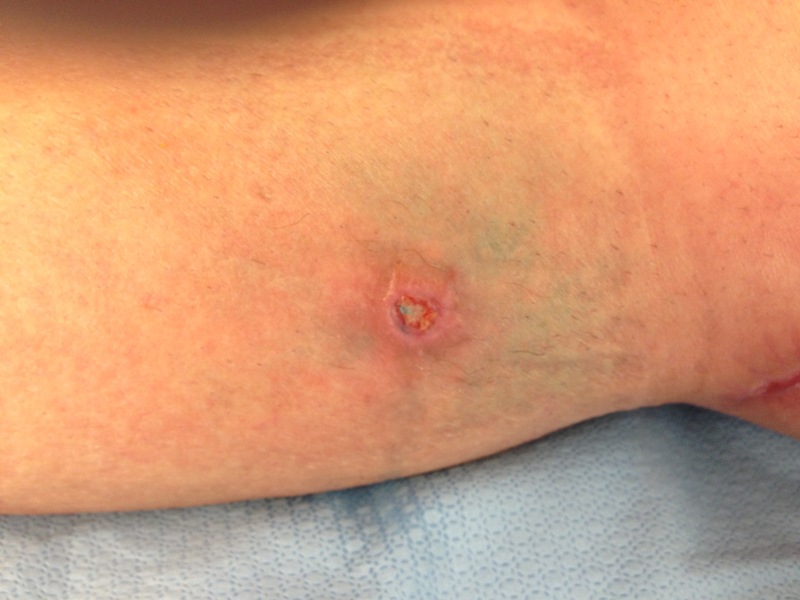 I suspected this to be a seroma from lymphatic leak. The lymphatics are an unusual system of vessels in that they are remnants of an earlier circulatory system that was designed to move and mix nutrients and primitive phagocytic immune cells throughout the external compartment of an organism. They are diaphanous vessels that have smooth muscles that periodically contract like cardiac muscle, propelling fluid and cellular components past valves. Typically, cautery, suturing, and the inflammation of wound healing are sufficient to close lymphatics, but when there is potential space and a large lymphatic trunk that has been divided within it, that space will be filled with fluid, particularly with edema fluid that accumulates post surgically with dependency. 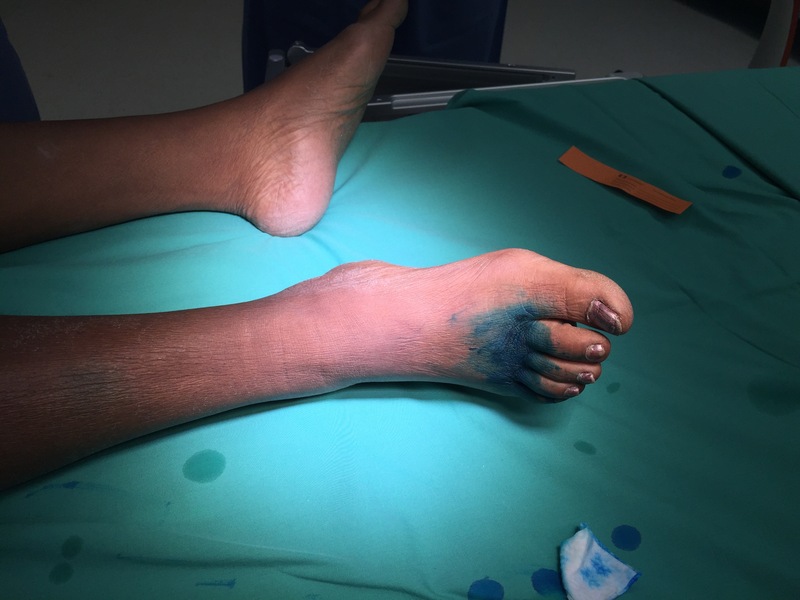 This patient was treated with I&D, but the lymphatic was identified by injection with Isosulfan blue in the subcutaneous space of the foot (between the toes). The dye is avidly taken up by the lymphatics and it can be used to identify the leak, allowing for extirpation and closure. Isosulfan blue is injected into the subcutaneous spaces between the toes. The vital dye will be cleared by the kidney -the pee will be greenish blue for a day or two. This is contraindicated in patients with known sulfa allergies. The dye is seen in the wound within minutes without any added measures -no pumping or massaging was required. The patient had begun spontaneously draining the night before her operation. The dye concentrates in the lymphatics which are easily identified. 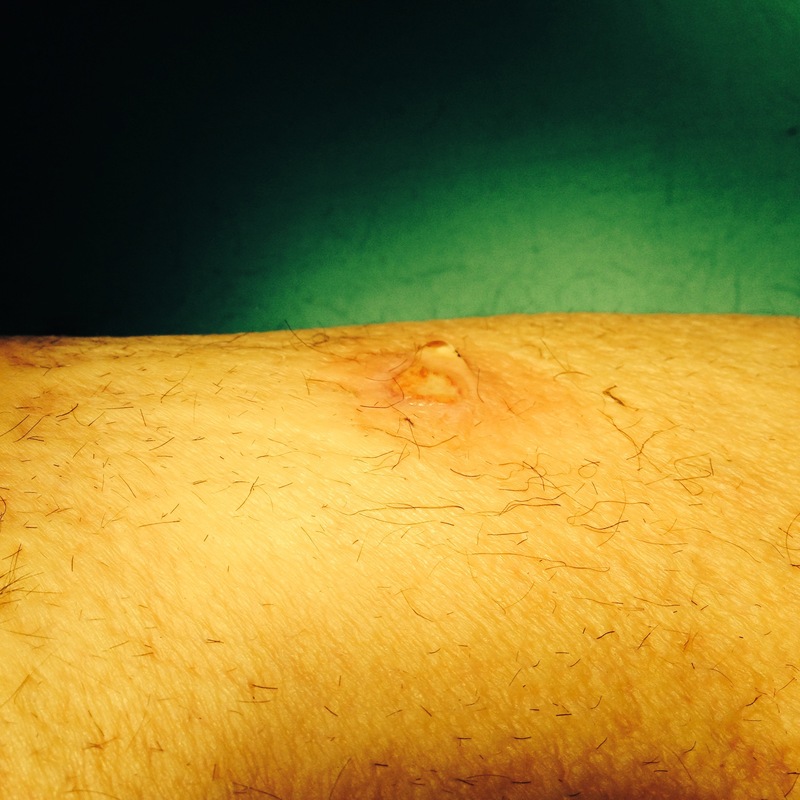 The lymphatics were ablated and a VAC dressing was applied. 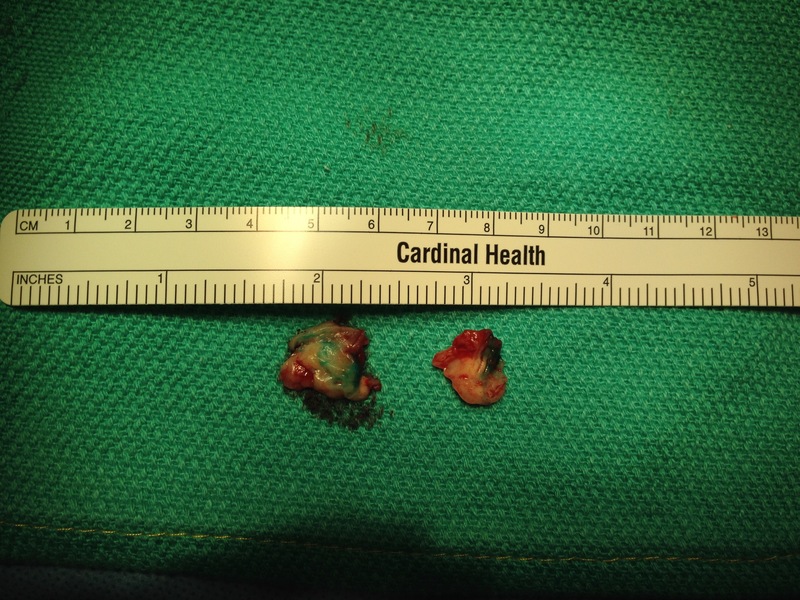 Two weeks later, there has been significant healing with complete resolution of the seroma. Loss of lymphatics at this level does not cause permanent injury but clearance of edema is slowed. Clearly, the avoidance of lymph leaks is the first step in preventing seromata, but when they occur, it is simple enough to identify and treat them using this technique. They are one way self circulating pipes and therefore treating the afferent termini is all that is necessary.